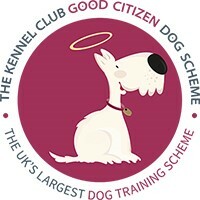 Playful Paws is for puppies under 6 months of age and includes the elements required for the Kennel Club Foundation Course. The aim of this course is to provide a safe environment for puppies to socialize, to learn and to play. 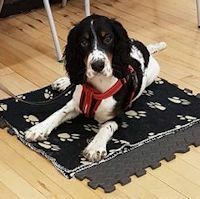 For owners, this course will help you to understand the body language of your puppy and others around you, how your puppy reads the world around them, the importance of using their innate behaviors and how to understand the natural behaviors of the puppy you have. 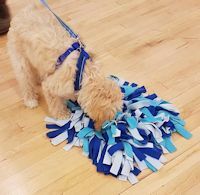 We need to keep our puppies safe in the environment we take them to, learning recall is one of the most important things we can teach our pups. 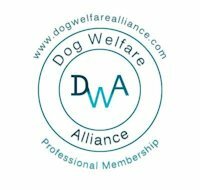 As they grow, we also need to understand our puppies emotional and physical needs so we need to think about their diet & exercise, the importance of chewing, choosing the right toys such as Kong’s and natural chews and we need to get them used to equipment such as collars, leads, harnesses and long lines. You will learn how to use the clicker, this is a tool to mark desirable behaviors . When we train a behavior it is important that we reward behaviours that we like. 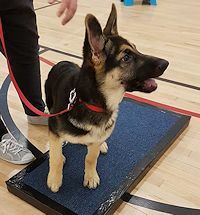 You will learn to teach your puppy to sit ,down ,stand, watch me, heel work, recall. As well as training, play and having fun with your dog is an important part of your puppies development. You will need: a settle mat, a clicker, high value treats, poo bags, a collar and clip on lead. You will also need to wear comfy clothes and shoes.